Two views of time in the slammer. Jail is not a fun time… When notorious mobster Al Capone was in jail, being punished for tax evasion, he spent the last year of his stay in the prison hospital. When he got out in 1939 at the age of 40 his health was gone and his mind soon followed. He died in 1947 from a mixture of neurosyphilis, pneumonia, a stroke, and cardiac arrest. 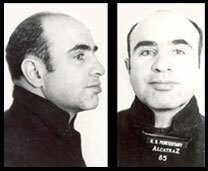 At that time he had the mental faculties of a 12-year-old child (http://en.wikipedia.org/wiki/Al_Capone#cite_note-ch11-28). Jail is an alternative… When I lived in Kentucky, street people used to be found hitchhiking along I75 in the Fall heading down to Florida for the Winter. Some of these low budget travelers would get picked up for vagrancy or drinking and spend 30 days or six months in jail. For some of them it was a good time to get hot meals, a decent bunk and some needed health care. 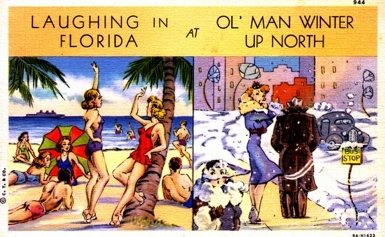 Jail was seen as an alternative to the Winter Florida vacation. Serious jail time causes one to lose the right to vote as well as the right to be out among the public. In the bad old days, jail was a room with few amenities. Often, your relatives had to bring you food, bribe the guards, and if you got sick, too bad. That’s not the case today. The courts have ruled that once someone is in jail they become a ward of the state and the state must feed, cloth and provide medical care. Handy as all that sounds, what’s it like to be old and sick and in jail? Several recent articles in the press have looked at the difficulties, fiscal and moral, of providing health care for elderly and dying inmates. “The fastest-growing population in federal and state prisons are those 55 and older, a trend that is forcing cash-strapped local governments to wrestle with the growing cost of caring for the aging inmates” (Jones & Chung). “One of the problems facing prisons is that many of their health care staff lack expertise in caring for the elderly, according to Linda Redford, director of the geriatric education center at the University of Kansas Medical Center” (NY Daily News). “Many states have adopted early release programs targeted at older inmates who are judged to pose little threat to public safety. However, a 2010 study by the Vera Institute of Justice in New York City found the laws were used infrequently, in part because of political considerations and complex review procedures. Redford said a common problem is finding nursing homes or other assisted-living facilities that will accept released inmates who have no family to live with. ‘Nursing homes don’t want former felons,’ she said. ‘Some states are looking at starting long-term care facilities outside prison that could take care of parolees.” (NY Daily News). Hospice programs have been developed inside prisons and they make great use of prisoners as volunteer helpers. For the prisoner with no outside family it is curious how this institution of punishment has become home. “‘For inmates who are terminally ill and have no close family on the outside, it’s probably more humane to let them die in prison if there’s a hospice program available,’ Redford said. ‘The inmates who are volunteering are at those guys’ sides when they die – they’re really committed to making the last days as comfortable as possible. They’re not going to get that on the outside’” (NY Daily News). “The rising tide of aging prisoners in the United States makes imperative renewed and careful thinking about how to protect the rights of the elderly while in prison, and about how age and infirmity can render continued incarceration a violation of human rights. Wholly apart from human rights considerations, however, states and the federal government should question whether the continued incarceration of those who are well advanced in age and are infirm is a sensible use of limited financial and human resources” (Fellner).